Rollers are not for everyone. Technique is everything and sleep is dreadful if you do not own a hooded dryer. Achieving spiral sets with fingercoils can be challenging on longer lengths, as the roots can frizz easily if the style is not created in extremely small sections, and who wants to stand in the mirror for hours? No one. 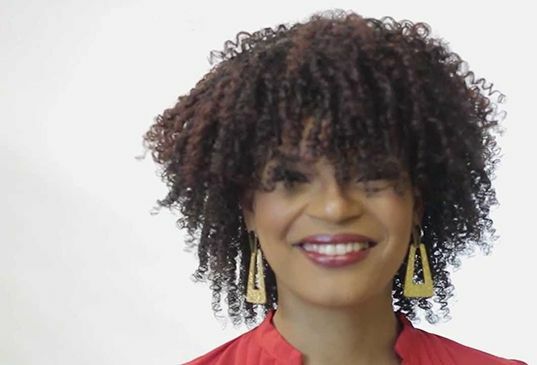 CurlBoxTV recently published a video featuring the Design Essentials Coconut & Monoi Deep Moisture Collection and what caught our eyes was the tool that was used to create the gorgeous curls on the first model! The D.Kurl Ring was created by the Design Essentials International Educator Deshonica Kerrie. The rings require little effort to install and create big results. Kerrie says that the amount of rings needed for your hair will depend on the length and density of your hair. You will need about twelve sections with two subsections per ring to complete an entire head. I will take 12 rings over 30-40 flexi rods, perm rods, or Curlformers any day! If you are roller set challenged, then this innovative tool is for you. For the best results, you want to start with freshly washed, detangled, and moisturized damp hair. Will you be trying these? We're considering it.